Into a complacent generation God placed Dawson Trotman. Full of contagious zeal, drive, and creativity, Trotman helped awaken those around him and exhorted Christians to single-mindedly obey God. Thousands responded to his challenge of fruitful discipleship. Now his challenge goes to you. The Navigator will motivate you to joyfully obey God more. It will invite you to share in Trotman's "bifocal vision": a consuming passion for the salvation of the world and also for the spiritual nurturing of one individual. He once said, "If you care for one, God can give you a burden for the world." 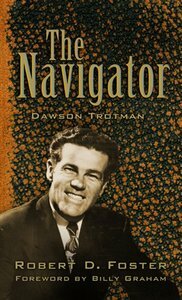 Through the worldwide Christian organization he founded, The Navigators, Trotman helped bring back some forgotten biblical truths: the importance of personal follow-up, one-on-one training, and the multiplication of disciples. Author Robert D. Foster, a longtime Navigator associate, combines his own personal recollections, interviews with those who knew Trotman, and Trotman's conference messages to portray a man who was unconventional and fun-loving?a strong disciplinarian with a compassionate heart. Let The Navigator help you find what God wants for your life and then help you wholeheartedly do it!